Time for another book excerpt post. 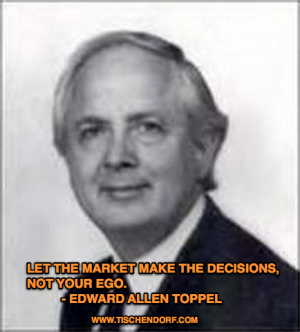 This one is from Edward Allen Toppel: ‘Zen in the Markets’, one of the first trading related books I ever bought. That’s the passage that made a lasting impression on me. Timeless wisdom. More or less stuff I write about on my website every day. As Dennis Gartman put it succinctly: ‘Complexity breeds confusion’. Did you say twenty-seven, twenty-eight, and twenty-nine? Brilliant! You’ve passed the second-hardest part of doing well in the market. Now for the hardest part. Look again at the numbers and say out loud the number that is the highest. Now say the lowest. Which number is between both numbers? Did you say that twenty-seven was the lowest and that twenty-nine was the highest? If you also said that twenty-eight was in the middle, then you’ve passed the test with flying colors! You are on your way to being very successful in the markets. You may be laughing, but I am dead serious. If it really is that simple to recognize what the market is saying at all times, why do you have to complicate it? The vision test that you have taken proves that you can recognize different numbers, and the I.Q. test demonstrates that you know the relationships among them. Believe me when I say that no other knowledge of the market is necessary. This exam determines that you are clearly capable of an egoless view of the market a Zen view, if you wish. A view that is free of personality needs. Twenty-nine is higher than twenty-seven. No one can dispute that. Not even your ego, no matter how hard it may try. You’ve proven beyond a shadow of a doubt that you can tell when you’ve got a profit and when you’ve got a loss. There is no question about it. Absolutely none. When you buy something at 27 and it goes to 29, you know that you are showing a profit. Absolutely no doubt about it. Conversely, when you do the opposite, you know that you are sitting with a loser. If you bought at 29 and now the price is lower, you must recognize that you have a loss. Don’t rationalize and say that you don’t have a loss until you sell. And don’t say that you know it will come back. You don’t know that, either. And if you say it’s a long-term investment, you’re just kidding yourself. That’s just another way of not having to deal with a mistake. Your ego is just hoping, trying to shield itself from the pain of being wrong. You’ve proven that you know the difference between a profit and a loss. That’s the easy part. Doing something about it is where the difficulty lies. 1. Never add to a loser. 2. Add to a winner only. 7. Let the market make the decisions, not your ego. The rules are not hard to understand. Recognizing a profit from a loss is simple. If the rules are easy to grasp and a profit is distinguishable from a loss, where does the problem lie? What makes it so hard to apply the rules? There is something within each of us that has a power over our minds that prevents our acting according to what we have agreed is the proper course of action. That something is present in all of us and is very powerful, more powerful than anything I know. Let’s call it ego. Until we learn to get rid of our ego, we will never make money in the market consistently. Those who haven’t identified the ego’s ways will eventually be destroyed in the market because of their ego’s tendencies. It is just that powerful. The market rewards those who have subdued their egos. Those who rid themselves of their egos are rewarded greatly. They are the superstars of their fields. In the market, rewards come in the form of profits. In the world of art, masterpieces are the results. In sports, the players are all-stars and command enormous salaries. Every pursuit has its own manifestation of victory over the ego. Let the market make the decisions, not your ego.